Before you have nose surgery, it is helpful to learn more about what is happening under the surface of the nose. Whether you have functional nasal surgery, known as Septoplasty, or cosmetic surgery known as Rhinoplasty, the interior anatomy of your nose is more intricate than you may realize. As a general rule, the bone and cartilage under the skin give the nose most of its size and shape. Other structures inside and behind the nose help you breathe. When you look at your nose in the mirror, you can divide it into three sections. The upper third or bridge of the nose is supported by bone. The middle section of the nose is comprised of cartilage, which supports the sides of the nose. And the lower section of the nose is supported by cartilage, which also provides the width, height, shape of the nostrils and tip of the nose. There are many structures inside the nose that help you breathe. 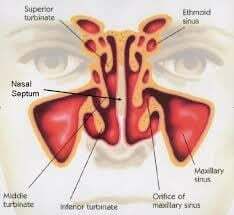 The nasal cavity is a hollow space behind the nose that air flows through. The septum is a thin strip of cartilage and bone. It divides the inside of the nose into two chambers. If you have a deviated septum the cartilage has shifted and the flow of air in one nostril or both can be blocked or minimized. The mucous membrane is thin tissue that lines the nose, sinuses and throat. It warms and moistens the air you breathe. It also makes the sticky mucus that helps clean air of dust and other small particles. The sinuses are hollow, air-filled chambers in the bones around your nose. Mucus from the sinuses drains into the nasal cavity. The turbinates on each side of the nose are curved, bony ridges lined with mucous membrane. They warm and moisten the air you breathe. If your turbinates are enlarged your breathing will be affected. Even though we have similar anatomical structures inside the nose, just like snowflakes, no two noses are exactly alike. The size and shape of the bone and cartilage and the overlying skin vary from person to person. So, it is important that you select a surgeon who specializes in nose surgery and has the skill and experience to address the unique challenges of every nose. You want to make sure that not only will your nose look good, you will be able to breathe well also following your nasal surgery. Dr. Russell Kridel specializes in plastic surgery of the face and neck and has performed thousands of nasal surgeries. With over 60 published scientific journal articles and textbook chapters on Rhinoplasty, he is often referred to by his peers as "The Nose Doc."